I started the chemotherapy pills this past Thursday. I was thinking as I looked at the bag that it really needed to be less scary and more motivational, like "You can do this!, Kick the Big C to the curb!.." Get rid of the yellow caution label and make it colorful. The bag is so "yuck". That's what I'm talking about! How great is that? Once again, how can I not be grateful for such a support system. I'm a lucky girl indeed! 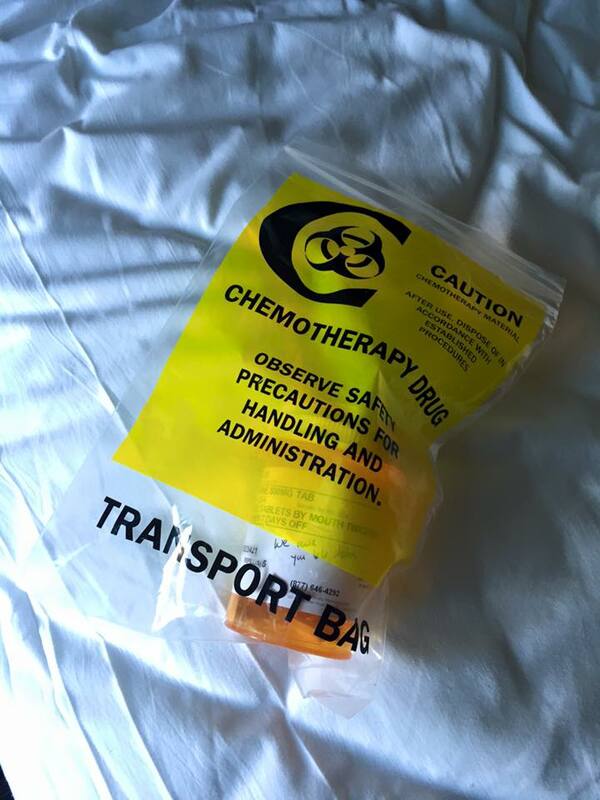 Meanwhile I've already had all these ideas in my head with how to go about changing the face of the plastic bags that hold the chemotherapy pills. (Please don't swipe this idea that I'm publicly sharing, that wouldn't be nice:). So, today makes day 6 of starting the beast killers. I'm afraid to say it so let me whisper, I'm doing ok and I haven't had much in the area of side effects. Everything has been manageable (I'm knocking on wood, of course). I also went for a follow-up appointment at the radiation oncologist this morning. We chatted for a while, then he did a quick exam, including checking my reflexes. We were very excited to see that both my knees had reflexes. Why is this so exciting? Well, one of the symptoms that brought me to my oncologist in June was the fact that I was having tingling on my left side, and then I lost feeling in my left knee. When he examined me, I had no reflex. The fact that I had one today means that there are positive results of the radiation I had on my brain...good news for sure! The radiation also continues to work long after the treatment stops, more good news and continued HOPE. Although it seems like I received the dreaded phone call from my oncologist yesterday, it's really been over a month. Honestly, it's been a bit frustrating and scary to be moving through things at what feels like a snail's pace. When you know you have the Big C throughout your body, you really would like to part with the unwelcome visitor ASAP. By the way I decided I really do like the word "visitor" because it indicates that it will be leaving, maybe not immediately, by eventually. So anyway, I feel like I've been anticipating climbing Mount Everest, but was actually never going to do so. I've been standing at the foot of the mountain, looking up, but never starting the climb. After today's appointment and starting the medication, I finally feel like I've started to climb the mountain, and I'm really looking forward to getting to the top, even if it takes patience and baby steps to get there. I'm also very thankful I have so many to climb this mountain right along side me. What kind of horses go out after dark? "When the sun is shining I can do anything; no mountain is too high, no trouble too difficult to overcome."